I found this awesome blog today, A Place Imagined, featuring amazing playhouses for kids. We will soon have a tree house to fix up for Walter, so this is great inspiration. This pirate ship is so cool! 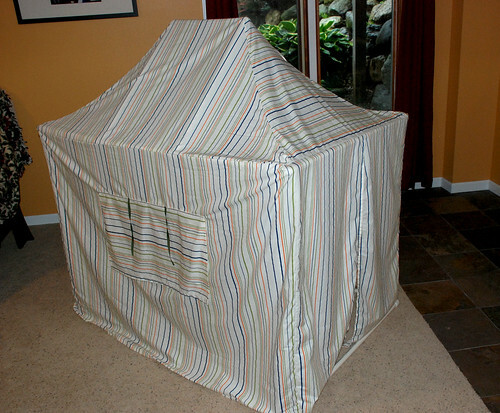 While I'm talking playhouses, here's a little playhouse/tent we made for Walter a few months ago. The frame is made from pvc pipe and fittings so it's easy to put together and take apart. 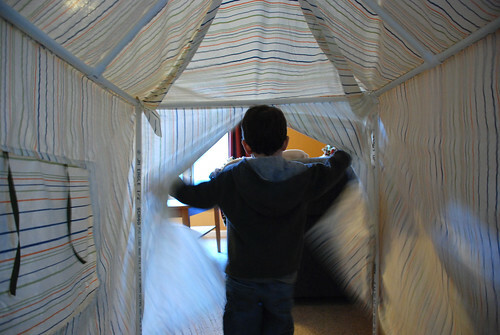 The fabric cover is made from a set of sheets – much cheaper than buying yards and yards of fabric. And when we want to put it away, it all gets stored in the pillowcase. The window is great for peek-a-boo and there are openings on both ends so Walter can run right through it. He also hides in it, throws balls into and out of it, and even has an occasional snack in there. It's nothing like the fabulous playhouses at A Place Imagined, but Walter seems to like it just fine. Minute Rice to the rescue!